What a week it has been in the media – truck drivers taking pot shots at motorists, the police taking pot shots at truck drivers…. The truth of the matter is that there are good and bad car drivers and good and bad truck drivers. Broad generalisations are not helpful. Education and courtesy go a long way in the right direction, finger pointing just gets people upset. And angry people on the road are never a good thing. I’ve been out and about again talking to people about their risk profiles, particularly in the wake of the NZTA rollover workshops. We’re helping fleets to evaluate their profile in regard to the key messages from those workshops. Understanding the message, and knowing how your fleet is stacking up are two different things, and, as they say, if you don’t measure it, you can’t manage it. Whilst sometimes, we have to break the news to a fleet owner that his risk profile is not what he was expecting or hoping for, it is fantastic to put the power back in his hands to manage it. With this last point, I have recently experienced this first hand. My previous car had a particularly accurate speedo, and I underestimated the value of this until I changed my car. As far as I can tell my car now has about an 8% variance so about 108 on the speedo is 100km/h in reality. But it feels weird driving at an indicated 108km/h when I spend so much time telling people to drive to the speed limit. I’ve had conversations about the effect on truck speedo accuracy caused by many things; changed wheel sizes, the difference of worn vs new tyres, altered gear box configurations amongst others. I’ve also spoken to people with older trucks where the speedo oscillates between 80-100km/h on the open road. When trying to drive to the speed limit, all of this uncertainty is a real distraction. Vehicle dashboards are supposed to be a driving aid, not a driving distraction, and yet these last few weeks I’ve found myself drawn to the precise position of the speedo needle at the expense of actively scanning the road ahead. 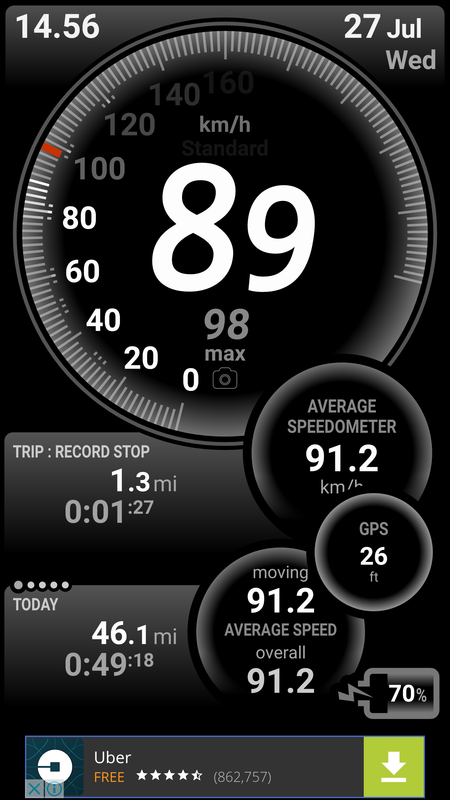 I’ve sussed it this week and activated an app on my Smartphone which gives me my speed, as measured by GPS, delivered to me in big digital numbers. Note – if you’re going to try this MAKE SURE your phone is in a cradle (not sliding around the dashboard) and plug in the charging cable as the screen brightness drains the battery quickly. But now I know what speed I am doing, I can focus back on the task at hand – predicting and avoiding the crazy actions of the other road users – both big and small. We’re the professionals out there – let’s lead by example.